Two important techniques you should know are how to save your data analysis project and how to open a project. They are important because you can then save your project at any time, and next time you want to revisit your project, you don’t need to repeat all the analyses you’ve already done. To save you current CisGenome project, click menu “File > Save Project”. A dialog will show up to help you save your project to a CisGenome Windows Project (*.cgw, or CGW) file. After you saved your project, you can try to close your project by clicking “File > Close Project”. You can then try to reload your project by choosing the menu “File > Open Project”. Once again, a dialog will jump out and ask you to choose a CGW file to open. 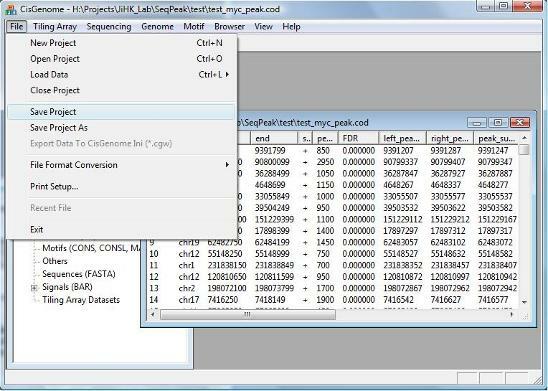 After you open the file, you will be able to see all the data in the project in the CisGenome Project Explorer Window. Remember to save your project frequently to avoid loss of your analysis efforts. The peak calling results are stored in a tab-delimited text file ended with *.cod. The meaning of each column can be found here.